Outside of Germany, or more specifically East Germany, few people will know who Gerd Natschinski is. The composer who died this week – only 19 days short of his 87th birthday – wrote some of the most successful and interesting operettas from Socialist Germany. Most of the titles have been forgotten after the fall of the wall, but his Oscar Wilde adaptation Mein Freund Bunbury (1964) and his Messeschlager Gisela (1960) were both revived last year, with very mixed results. 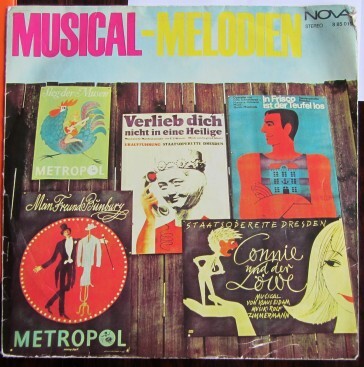 A vintage LP with some of the greatest hits from the DDR, including “Mein Freund Bunbury”. Natschinski grew up in Dresden, where he could be spotted regularly in later years on opening nights at the Staatsoperette. He wrote many scores for film classics from the DDR, among them the summer holiday favorite Heißer Sommer. The music tries to blend popular American rhythms, as heard in Bernstein’s West Side Story, with local traditions. Later, in Mein Freund Bunbury, Natschinski took the success of My Fair Lady as an example and wrote his own second-hand UK show – because of its apolitical nature, Bunbury has remained an audience favorite in Eastern Germany, it is played regularly at concerts and got a new revival staging at the Musikalische Komödie Leipzig last year. Meanwhile, operetta crusaders in Berlin also tried to revive Natschinski’s deliciously wicked Messeschlager Gisela about the contrast between East and West Germany’s society (a bit like Billy Wilder’s One, Two, Three). But the latest production on Rüdersdorf flopped, not because it was badly done, but because East Berlin audiences did not want to be bothers with such political aspects in an operetta. Years ago, the Neuköllner Oper presented Peter Lunds version of Gisela and landed one of the greatest surprise hits in their history. But then again the audience was a very different one to Rüdersdorf. Natschinski was the head of the Große Unterhaltungsorchester of the East German radio, the Leipziger Rundfunk. He also conducted the Unterhaltungsorchester of the Berliner Rundfunks. He was even intendant of the Metropol-Theater in Berlin from 1977 to 1989, as well as the vice president of the DDR-Komponistenverband. As DDR operetta expert Roland Dippel has pointed out, Natschinski wrote the script for an autobiography that has not yet been published. Because he did not want to be interrogated about his involvement with the East German party system, he has not given any in depth interviews about his career, party convention compositions and the background of the operetta industry in the DDR. Even though he would have been the best qualified person to do so, certainly as intendant of the Meteropol. He died this week in a hospital in Berlin, as his son Thomas told the press today. This leaves only Guido Masanetz, the 101 year old other successful operetta composer from the East (In Frisco ist der Teufel los). But just like Natschinski, Masanetz does not want to talk to the press for fear of critical question regarding his political involvement in Socialist times. It’s obviously a fascinating topic that the next generation of operetta researchers should tackle.